Primary Video Camera: In March of 2014 I started using a Nikon D5300 ($800) with a Sigma 18-200mm f3.5-6.3 lens ($400) as my primary video camera. I have been pretty happy with it so far with the exception of a few things. 1) The autofocus in the lens doesn't work at all in live view. It is hard to work around and when I am "filming", generally I focus manually. 2) It took me a bit of time to figure out that there is a setting "Manual Movie Settings On/Off" which defaults to "Off". Even with the camera in "Manual Mode" while displaying changes in shutter speed, aperture and iso speed, those changes have no effect because the "Manual Movie Setting" is "Off". I switched it to "On" and now I can change all those settings. Secondary Video Camera: The majority of the video filmed before March of 2014 was shot using a Canon Vixia HV40 ($650). I purchased the D5300 because the tape head of this miniDV camera was starting to wear out for the second time. Now I use this camera when I need to film something from multiple angles at the same time. Actually, I have two Canon Vixia HV40s, the tape head on one had worn out and I needed to keep filming, so I sent one in for repair and purchased another. Tertiary Video Camera: Go Pro Hero 3 ($300) and various camera mounts. I use this for time lapse, when I am dropping something on the camera, placing it on an escalator, mounting it on a car, or filming underwater. Quaternary Video Camera: iPhone 5s ($400). Sometimes I need to film something a 120 frames per second or I find something when I am out and about and need to film it. 15" MacBook Pro with Retina Display ($2500): I need a rather powerful, mobile computer. This is it. Recording Audio: The microphone on the video camera is used only for syncing the externally recorded audio to the video. For good stereo separation and to be able to record at 48kHz/24bit, external to the camera I have two M-Audio Nova Class A Fet microphones ($90) attached to a Zoom H4n ($260). I also use a Rode smartLav+ ($70) for mr.p's audio. It's a relatively inexpensive Lavalier mic that plugs into my iPhone. If you buy one, turn off iOS processing in the RODE Rec iOS App! 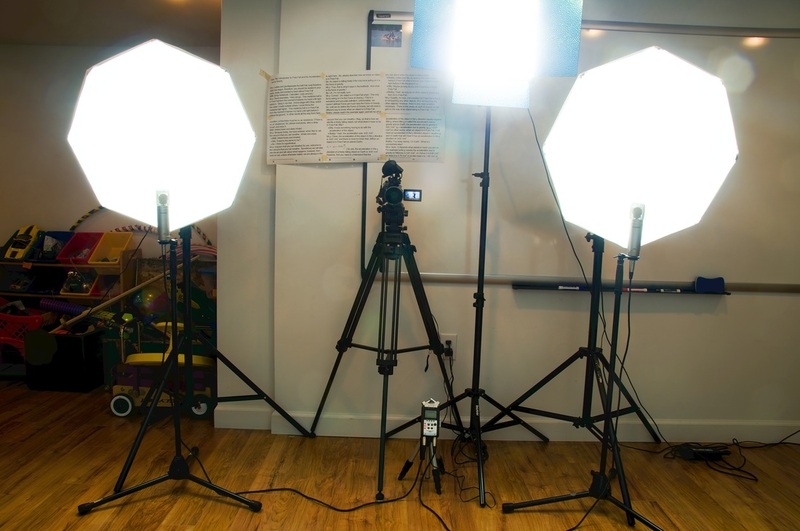 Lighting: I have one Bescor LED-1200 Bi Color Studio Light ($700) which I love. I can adjust the temperature and brightness of the light and it came with an air-cushioned light stand. I have a pair of Interfit INT293 Super Coolite 455s ($240) which I purchased from Amazon and I recommend that you never purchase these. They are pieces of junk which arrived with 3 out of the 8 bulbs and both light stands broken. Amazon refunded a large enough portion of the cost so that I could replace the broken pieces, however, they are still flimsy and I am just waiting for them to break. Teleprompter: Wow, what a difference a teleprompter makes. Glide Gear TMP-500 Tripod & Shoulder Mount Tablet/Phone Teleprompter. ~$250. Requires a tablet and app. I use an iPad and the ~$12 iOS app PromptSmart Pro. Final Cut Pro is my main video editor. It is an awesome program. The shots of Billy, Bobby and Bo require professional level video software. I use Adobe Illustrator for all my video graphic overlays, for example all of the vector diagrams. It is also what I use to get equations into the video. It amazes me how I have to first use MathType, copy it to Adobe Illustrator and then export as a .png file to get my equations in to the videos. Adobe Audition is the program I use to clean up the audio before I even start working with it in Final Cut Pro. For the website I use Weebly. It is easy and relatively low cost. Not quite as functional as I would like it to be however, it is good enough for now. For my multitrack audio recordings like the Flipping Physics intro music I use GarageBand. Apple's Motion program I am just starting to learn how to use and I did some motion tracking which was fun. Reflector is a program I use to mirror what is on the iPad so that I can screen capture using Quicktime and display the iPad screen in a video. I purchased a long, green sheet of paper to use as a green screen and I am amazed at how well it works. I purchased it from BHPhotoVideo. For royalty free music and sound effects I utilize the libraries that came with Final Cut Pro, GarageBand and iMovie. I also sometimes use sounds from FreeSound.org. I purchased both ProScores and Designer Sound FX from VideoCopilot. Backups: I use a Time Capsule to keep a local Time Machine backup every hour. There is an external hard drive that I use along with Carbon Copy Cloner to create a clone of my hard drive every night. I even use BackBlaze to keep a backup of my essential files in the cloud. Never underestimate the usefulness of having multiple backups. On 2014.03.14 the Final Cut Pro library I was working with got corrupted and I almost lost 2 days of work. Using my local backups and AppleCare Support, it took me about an hour to reconstruct the library.